I kept seeing fab Instagram pics of Winona Forever, as well as was told by my Welly friend Trishy Mac, that it’s a must visit. It all proved to be so true. I couldn’t believe my young, trendy cousin had already beaten me here, however he was game to join me for his second visit.After flying up early, and checking into my hotel, I did a big walk up the Parnell hill contributing to my 10,000 steps. It was humid, drizzling and I actually walked right past this place, as I was on the wrong side. What I love about the CBD/local ‘burb Aucklanders is they get up early, exercise and then head for a brunch spot. Their cafes cater for this and open early on weekends, many at 7am. 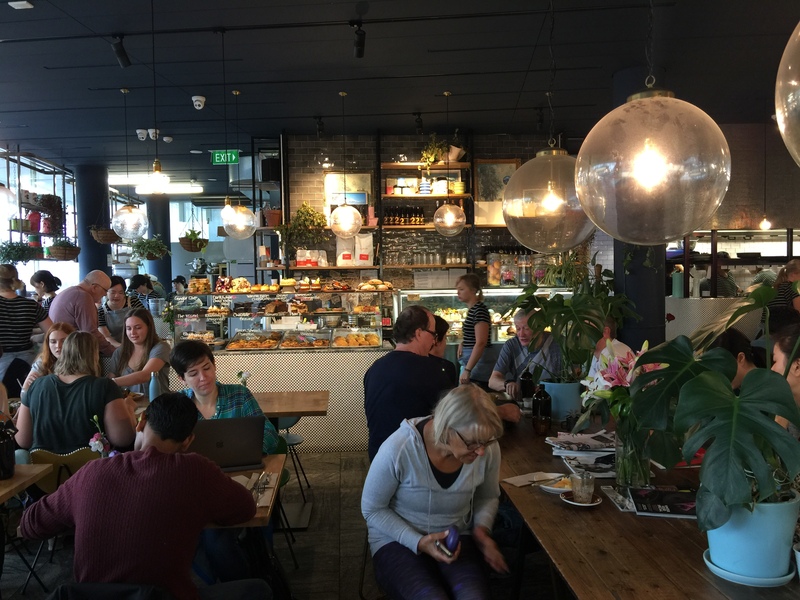 By 8am many cafes are already full and at 10am this place was buzzing. Peeps were finishing up, so we were lucky to get a table for deux. As I squeezed past the throngs, I noticed someone with a turmeric latte. Boom. Decision made. Our lovely Argentinian waitress sat us at a table with me facing the tempting cabinet, bulging with sweet donuts, bliss balls, slices etc- many GF DF etc. We ordered drinks immediately. Mine with coconut milk. Jolan chose a hot chocolate and this was no ordinary hot choccie. 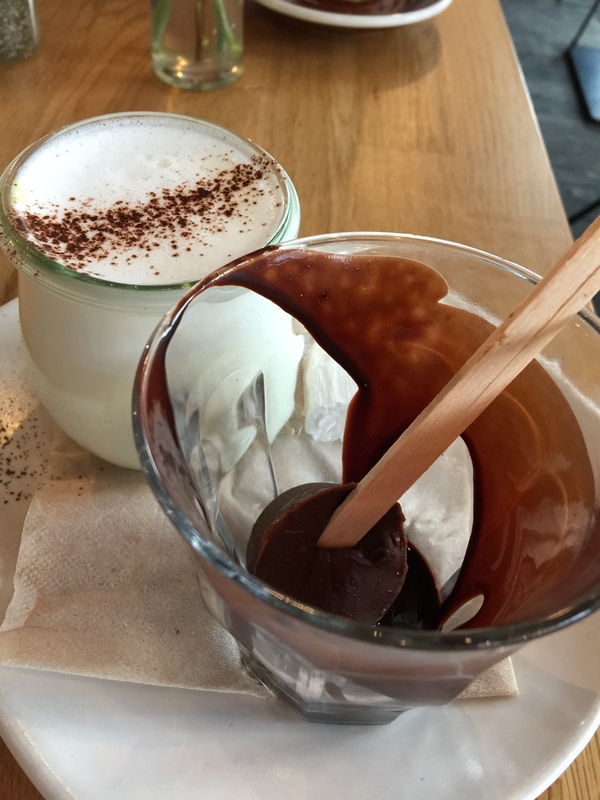 It was a piece of art with homemade marshmellows on the side and a glass of hot milk and then you dunked your speared chocolate block into it! You could choose dark chocolate, choc/orange, white chocolate, coconut or peanut butter. Yum. As for the menu, I could have demolished everything. Such a good sign. Some of the titles were cute e.g. You’re an egg (eggs anyway) or Magic(al) Mushrooms. Honestly the selection was outstanding. I thought I knew in advance what I was going to order. 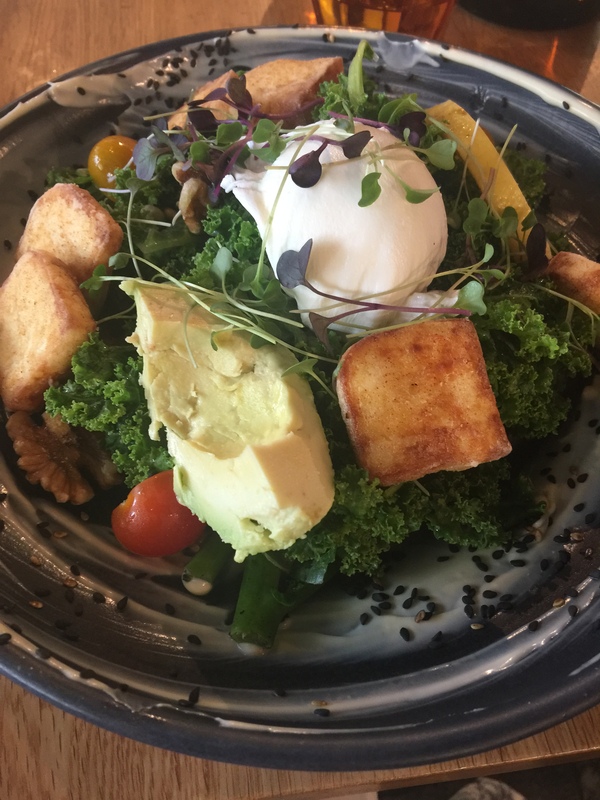 I finally settled on the Hello Me Bowl; GF, halloumi, seasonal greens, kale, bean sprouts, cherry tomatoes, avocado, toasted seeds with a poached egg . I can’t remember there being any seasonal greens other than kale but it was great. 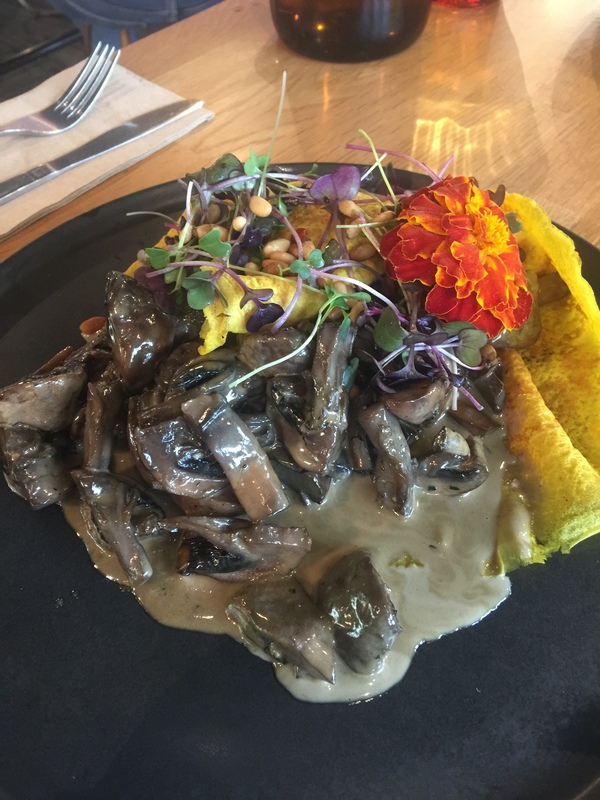 Cousin chose the magical mushrooms served on an open omelette. Yummy. Very happy. Other offerings were; organic soaked oats, vegan pannacotta with fruit, beans on beans, chorizo chilli scrambled egg, eton rifle pavlova (French brioche with berries/crushed meringue- sounded amazing but too sweet for me), Salmon benedict, Big Breakfast, the Ladyboy (crumbed prawns on brioche- yum), Bene burger or a vegan bowl. There was a fab drinks menu; organic juice, soda, sparkly water, chai, tea, smoothies, various coffees and Latte Lab- turmeric, beetroot, matcha, ginger- so me :). I was dealing with the most horrendous sciatica which I’ve never had in my life. 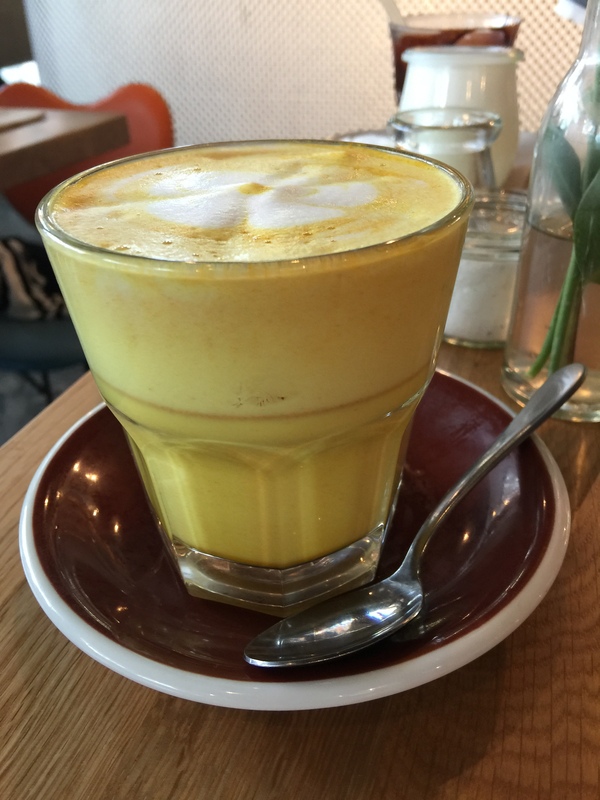 I swear that after my turmeric latte (and an extra request for more coconut milk to soak up all the leftover tumeric), that it definitely eased my pain, along with walking of course. I’m now trying to add a pinch of turmeric powder in all my meals daily, as you can’t taste it. I haven’t tried it in my long black yet so that will be interesting. I ummed and ahhed about a sweet treat but resisted as I wanted to try something from Little Bird Unbakery on Customs St, for my mid afternoon snack. 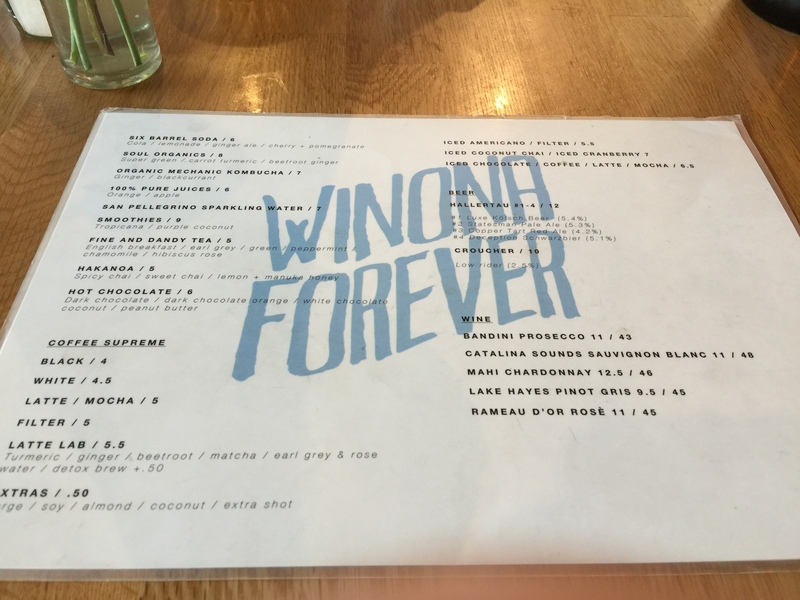 There was no sign of Winona Ryder or any other celebrity, but Winona Forever is forever in my heart.